What a delight! 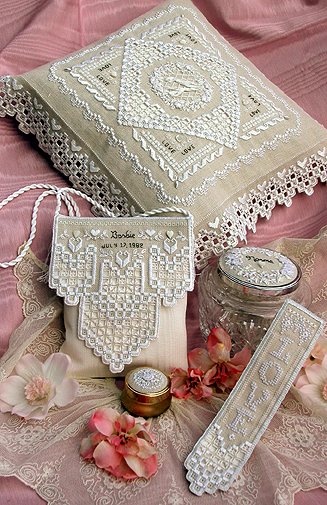 Creamy white silk threads, white silk ribbon, shimmering metallic and soft silky perles lend the same enchantment to these wedding treasures as you find in my Heirloom Wedding Sampler leaflet. 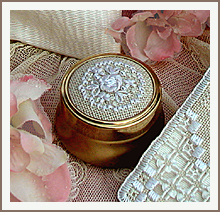 The new Ring Bearer’s Pillow, the beautiful floral pearl encrusted potpourri jar lids, the exquisite Hardanger purse for the bride to carry on her special day, and the love-ly Bible Bookmark all show the same attention to detail you expect from the heirloom samplers. The importance of LOVE as the underlying reason for a wedding celebration shows in each piece! The Ring Bearer’s pillow model was stitched on 25 ct Platinum linen, using White Trebizond for all the Hardanger satin stitching, and a variety of luscious fibres and precious beads to enhance the area where the rings go. There is a close-up photo on the back cover of the leaflet, so you can see more clearly. All the other pieces are stitched on 28 ct Platinum Cashel.. and we recommend that you use the Soie Perlee white for the satin stitches, especially the buttonhole stitching, for these pieces. Remember that there is also a free bridesmaid gift ornament, on the website, and we're adding a small free potpourri lid design for your further stitching ! I invite you to use all the elements and bands of the Heirloom Wedding charts to embellish other items you might like.. such as place cards, candle holders, garters or sachets full of rose petals. However you use these designs, I hope you stitch this pattern with joy and kindness as a true Labour of Love. (or 28ct Platinum Cashel - 13.3"